On to some testing. One of the most convenient ways to stress-test your PSU is to use OCCT by ocbase. This uses a Furmark-like animation to load up your GPU while also maxing out all your CPU cores. It graphs temperatures, voltages and other hardware monitor info so you can see how the PSU behaves when your system is using peak power. The charts cover before, during and after the stress-test, as it's often during the transitions that a cheaper PSU will have poor regulation of voltages. It's worth noting that it doesn't thrash the storage side of things, so it's not a complete representation of all the power your system could possibly draw. But it's pretty close. 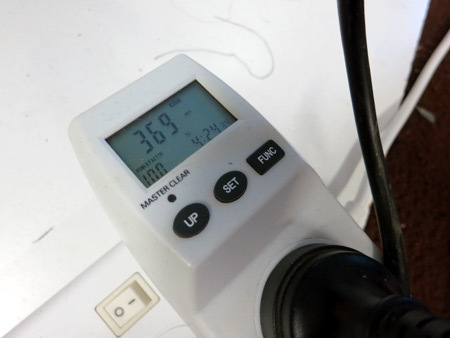 I also used a wall-plug meter to see how much power was actually being drawn by the PCs. Testbed #1 is a few years old, with an i7-920 CPU, a Radeon HD 4850 video card and two platter-based HDDs as well as a boot SSD. During testing the wall meter registered a peak of 369W being used by this PC. Testbed #2 is a more modern PC, built about 18 months ago, around a Haswell i5-4690S using the onboard Intel HD Graphics 4600, a PCI-E SSD for the system and a larger SATA SSD for data. Interestingly the peak wattage I could get from the line meter on this one was only 128W. I only managed that when I ran OCCT and benchmarked the SSDs at the same time. The biggest variance was on the 12v line when using the FSP 850W, but even then it's well within the ATX spec and is rock-solid at each voltage level. I also ran both FSP PSUs in general use in both those PCs for several days, with the 700W in my main PC (Testbed #1) and the 850W in my media-converting, video-editing and game-playing PC (Testbed #2). In both cases there was nothing significant to report in terms of problems. As should be expected of a good quality PSU, you can pretty much ignore them once installed. There's a couple of ways the FSPs score over the Corsairs in my view. Firstly, they are physically smaller. The Corsair RM750 is a very long PSU and has issues fitting into some cases. The FSP 850W is shorter and the 700W shorter still, making installation much easier. The second advantage requires me to go off on a slight tangent about fan control. As mentioned earlier, the FSP 700W has a fan control circuit but doesn't ever turn the fan completely off. The FSP 850W does have a zero-noise function whereby it completely turns the fan off when it can. I was a little concerned about this after my experience with the Corsair RM750, which I have never - I repeat, never - seen turn the fan on. Even when the PSU case is physically hot to the touch, the CPU heatsink is pouring out heat and the GPU fan is screaming, the RM750 steadfastly refuses to spin up. This is presumably because we're just not loading the PSU up enough that it bothers to turn the fan on. My issue is that it seems to be ignoring the temperature completely. Now, I know a correctly-specced and well-designed system shouldn't rely on the PSU fan for cooling, but I'd wager that most towers do factor in that the PSU will be positioned at top rear and will be exhausting hot air. 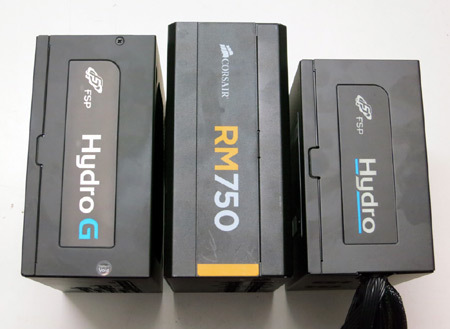 Given I bought the RM750 to replace an older PSU, and chose a high-wattage unit because I figured overkill is better than underkill, it was simply slotted into an existing system and expected, incorrectly, to do its part. I am not the only person with this issue (and no, mine is not covered by the recall for PSUs that shut down unexpectedly). Anyway, the point of all this is to happily note that the FSP 850W behaves much more sensibly, turning the fan on during heavy load as expected but also in response to temperature. The manual says the fan is activated at 30% load, but I actually saw it turn on for a while after the PC was idling on the testbench for a few minutes, presumably because the PSU's innards had reached the triggering temperature. So that's good news. Speaking of which, both FSP PSUs are pleasantly quiet even with the fan on. Both were quieter than the stock Intel cooler in testbed #2 under load. In Testbed #1 you can't hear anything over the Radeon's fan screaming along at nearly 15,000rpm under load! At idle both PSUs are essentially silent, with a faint sound coming from the 700W but barely distinguishable from the stock CPU cooler. As mentioned in the prelude to this article, there's a limit to how technical I can get when testing PSUs. But based on my real-world usage of these two units, I have no issues recommending FSP PSUs. They seem well-made, perform well and tick the right boxes feature-wise. The five year warranty is a nice touch as well. Definitely have them on your short-list if you're shopping around. Thanks to FSP Group for the opportunity to test these PSUs. Feel free to discuss this review in this thread.